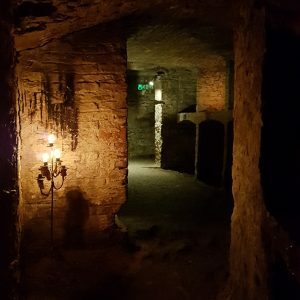 One of the tours I did with Merkat Tours during my trip to Edinburgh was the Ghostly Underground tour. This one starts in the centre of the Royal Mile, with our energetic guide walking us through closes while telling us haunting stories about the history of the Old Town, before taking us to the old vaults under the South Bridge. 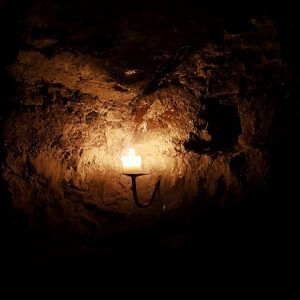 The vaults are dark, damp and very creepy, lit mostly by candles and some safety lights. Our guide told us fantastic stories about the hustle and bustle in these dark parts of town back in the day, as well as ghostly tales about the spectres commonly seen down here. With near darkness and a sinister atmosphere, the vaults were a fantatic visit and our guide really brought out the stories very well. The mould in these vaults made my asthma go nuts, but I survived and really enjoyed the tour! Four and a half out of six rainbow sloths!